Bolingbrook Mayor Roger Claar punished an Illuminati operative for incompetence following the Illinois Sixth Congressional Debate. 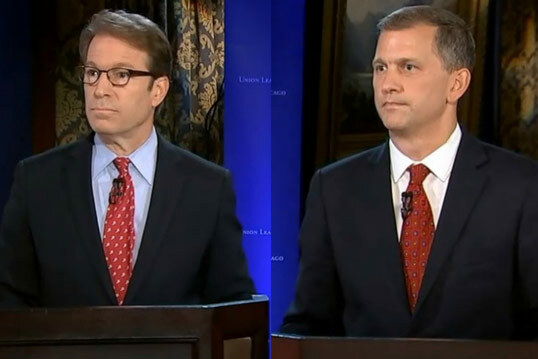 Rep. Peter Roskam (Left) and Sean Casten (Right) during their first televised debate on Fox 32 in Chicago. According to a transcript obtained by the Babbler, the operative was supposed to plant a device in Rep. Peter Roskam’s podium to calm him, and another in Sean Casten’s podium to make him angry and agitated. The operative mixed up the podiums. In the transcript, she knelt before Claar and begged for forgiveness. Claar said he could have her executed, but he would show her mercy. He ordered her to drive the “Gauntlet of Boredom” and not to return until she completed 100 laps. Sources within the Chicagoland Illuminati say the operative was last seen driving towards the construction site at Weber Road and trying to get on to I-55. A staffer at Casten’s Barrington’s campaign headquarters refused to comment about the Illuminati: “Fake stories don’t matter. What matters is Sean won the debate, and we’re celebrating. The Barrington Battle Station is ready for victory in November!” Dance music played in the background for a few seconds then suddenly stopped. The camera turned to show Roskam standing on the porch of an irate resident. The woman flipped off Roskam and slammed the door.